It was one of those gorgeous summer days that I’ll remember all year. Mrs Best Beer HQ and I were up north, exploring the picturesque Whangaparaoa Peninsula, when I got a hankering for a beer on the beach (as you do). So we made a beeline to the Four Square at Gulf Harbour, where I picked up this bottle of Moa Southern Alps White IPA. Blurb about the beer: Brewed with Vienna and Pale Wheat malts, Moa Southern Alps is hopped and dry hopped with a blend of Nelson Sauvin and Citra hops giving a strong citrus/lemon grass aroma. Add the esters from a Belgian ale yeast and coriander for spicing and you have quite some complexity in this fusion of Belgian Wit and I.P.A. Tastes like: Beer + sunshine + beach = heaven. It’s a very simple equation, which doesn’t quite do justice to this hazy, spicy, lively beer. It has a fresh, wheaty, grassy aroma, and tastes of banana, grapefruit, coriander, and black pepper. It’s reasonably light for an IPA, but also reasonably heavy for a wheat beer, making it an unusual drop that’ll win some fans and repel others. I’m a fan. 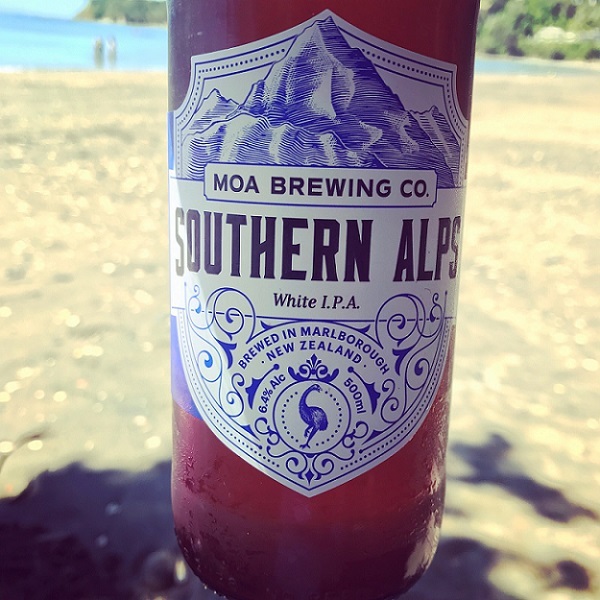 Moa’s Southern Alps White IPA is something a bit different, a little quirky, but still infinitely drinkable. I could have drunk any beer on the beach that day and been satisfied, but I’m glad I drank this one. Beer/movie combination: What’s my favourite beach film? Well, it’s certainly not that crappy Leonardo DiCaprio flick The Beach (though I do remember enjoying the book by Alex Garland quite a bit). Come to think of it, it’s probably Jaws, but though I enjoyed Moa’s Southern Alps White IPA it’s not exactly a Jaws-calibre beer. Few beers are that amazing. It’s more of a Point Break kind of a beer – the infinitely quotable, high-octane original, and not the abysmal remake that I haven’t bothered to watch.